Take the work out of 'teamwork.' Transform your internal meetings into vehicles of progress with our general team meeting template. What is the purpose of this team meeting? Include any objectives and discussion topics. Does this meeting have a pre-planned agenda or structure? Include it here for easy reference. Summarize all relevant discussion points here. What were the main insights from this team meeting? Include key decisions made, progress reports, and any opportunities, issues, or concerns that should be shared with colleagues. Is there any other valuable information worth sharing? It does not have to be directly related to the meeting topic. List all key stakeholders not present and other departments that this information should be shared with. How will we keep in touch and stay up-to-date about progress? Should we schedule another meeting? Your team is your most important investment. But internal meetings have become the bane of modern companies. That's a shame. In truth, nothing cultivates trust and connects your team better than a well-run team meeting. Enable your team to be more effective than ever before with our team meeting template. Treat this team meeting template as your adaptable agenda. Internal meetings can often involve more time, effort, and people than needed due to disorganization. This malleable meeting note template can be customized to fit any type of team meeting. So you can focus on the insights and initiatives you need to without wasting any resources. You can also say goodbye to overcrowded conference rooms. Everything you capture can be seamlessly centralized and shared. 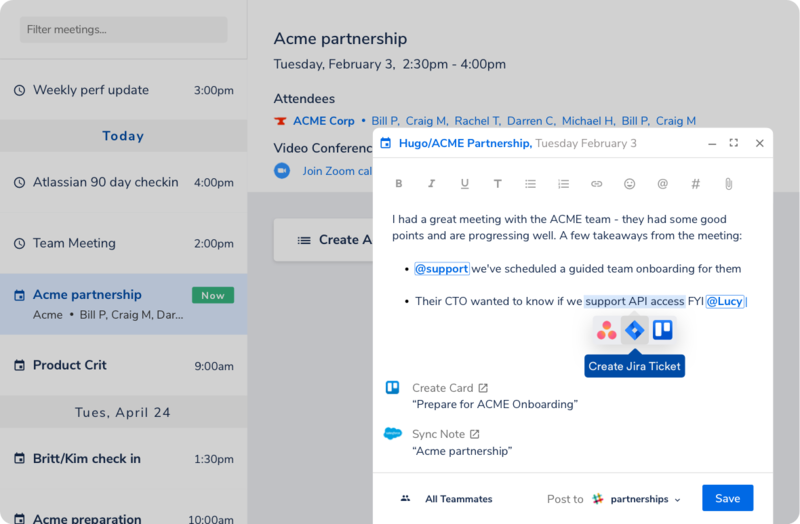 Keeping your entire team on the same page (even if they're not in the same room) has never been this easy. Sharing spurs cross-pollination and out-of-the-box insights. In turn, these drive creativity and collaboration—the main ingredients of innovation. Of course, organizing your team's next steps toward success means nothing if those steps aren't taken. This team meeting template lets you take notes that take action. With simple integration capabilities, you can transform plans into actionable and assignable items in your team's favorite tech tools and platforms. Take the work out of "teamwork." Try this meeting note template today.